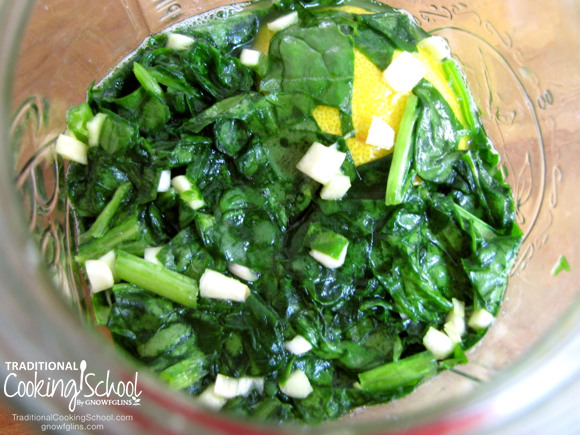 Did you know that you can ferment vegetable greens? Yes, you can! And it's a really good idea because dark leafy greens are high in oxalic acid. In addition to steaming, fermentation reduces this anti-nutrient — which would otherwise interfere with mineral absorption. Spinach kraut is a fresh, lemony, and salty take on regular old cabbage kraut. And out of all fermented vegetables, it is so easy to make! We love it. We even take it on picnics! Check out my book, The Complete Idiot's Guide To Fermenting Foods, and our Fermentation eCourse for even more fermenting recipes — including lemon and dill spinach sticks! Chop up the spinach coarsely and toss it with all the other ingredients (except lemon) in a bowl. Cover the bowl with a tea towel and let sit for 30 minutes. During that time, the salt will begin to pull juices out of the spinach and the mixture will get juicy. You can mash it to help it along. Pack it all in a quart size fermenting container. Tuck in the lemon wedge, too. Leave 1-inch space at the top of the jar. Cover the jar tightly with its lid or with an airlock if you're using that. Let ferment at room temperature for about 2 to 3 days, then transfer to cool storage. 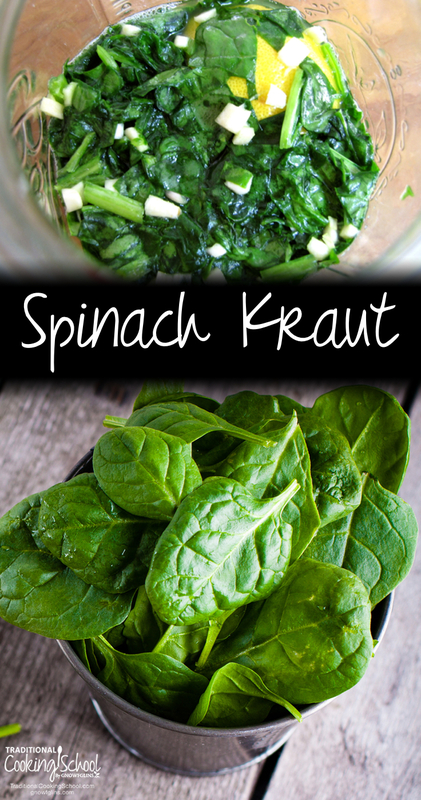 Will you give Spinach Kraut a try? What are your other favorite fermented vegetables? This post was featured in 37 Ferments for Spring. This is awesome. Do you think this would work with mustard greens? I planted two little mustard seeds and have mustard leaves the size of my two year old. I throw some to our chickens every morning (the mustard leaves, not my two year old), and am wondering if you think this might work or have ever tried it? Any other ideas for using mustard greens? I’m literally swimming in these things every time I walk out to my garden. This sounds fantastic! I never tried fermenting any greens (I figured they would practically melt after fermenting for so long). I absolutely love spinach! I think I’ll try throwing some herbs in there (parsley and dill), since I love those flavors together. Thanks for such a lovely idea! I was wondering if it works with kale. I’m supposin’ that if it works with mustard greens, it would work with kale. Elisabeth — Yes. 🙂 Just it may taste different. I have some spinach that is pretty well wilted. I think that I’m going to try this with it this weekend. I took my first bite today. It was pretty good. I’ll definitely be making more. My book arrived the other day and I’m enjoying it too. Thank you for writing it! I just bought your book and saw this recipe in it. I tried it right away. I have left the spinach fermenting for 3 days not but it does not seem to be getting any action. There aren’t any visible bubbles and it does not seem to be getting tangy the way sauerkraut does. Should it be the same ferment as regular kraut i.e. bubbles and getting a more sour taste? I don’t want to leave this sit too long and get some unwanted bacteria in it. Right now it just tastes like garlic spinach. 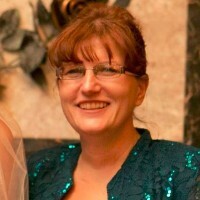 Dianne — This isn’t a very bubbly ferment, but it should get more sour. You can move it to the fridge to “age” it and develop the sour flavor. Thanks for purchasing my book! I have moved it to the fridge so will see if it gets a bit more tangy. Looking forward to reading the book cover to cover!! Just wondering if yours ever got more sour, and if so, how long did it take? I am just trying out lacto-fermenting from our garden, but have been making Kimchi for many years. Your problem may be related to chlorinated water. Wash and jar with bottled water, or fill a food-safe bucket with tap water and let the chlorine evaporate out for a full day. Chlorine will kill the bacteria you want, so don’t use it. Just assembled my first batch. I’ll get back to you. Does anyone know if the goiteroid properties of the cabbage family plants are neutralized in the fermentation process. I have Hashimoto’s (hypothyroid) and need to avoid any thyroid slowing agents, but so want to enjoy cultured sauerkraut and other cabbage family veggies. Any info of suggested reading is appreciated because I cannot find any info on this issue. Thanks! My functional medicine doctor told me if it’s fermented, steamed, or juiced, the goitrogenic effects are cancelled. I just came across the page on fermenting greens on Culture For Health site and it said the goitrogenic effects are NOT cancelled with fermentation. I just recieved a huge amount of spinach from my CSA. While washing it my hubinator said “I wonder if you can ferment leafy things?” He then did a quick search and came back to me that we could and it was called spinach kraut. I said “awesome, but let me just check some of my go to sites and see what they say”. I instantly checked your site and he came to look over my shoulder and said “that’s it! That’s the recipe I found!” So glad we were on the same page, no pun intended 🙂 anyway that long story leads me to the fact that I am about to turn my massive spinach win into your lovely looking ferment, so excited!!!! I’ll let you know how it goes 🙂 Thank you! I’ve made sauerkraut (I like using red cabbage), fermented garlic (it took 16 bulbs to fill a quart jar), and carrots; but never thought of spinach. I may have to try this. Terrific idea and love the added lemon! I’ve been loving making kimchi from cabbages, bok choi, mustard greens, whatever nice looking leafy greens we can find at the grocery store. So much fun and makes a quick easy green veg a snap for snack or meal. My husband isn’t nuts about the taste of my kimchi so maybe this plain veg ferment with lemon will do the trick. Thanks for the great idea! I’m going to give this a try today with a combination of green and red swiss chard. Lots in the garden and a great way to use up. Hope we like it!! Should the swiss chard, or kale be streamed slightly first? And then cooled off of course. I remember my grandfather ‘pickling’ swiss chard in a large crock in the basement. As I recall, the process turned the leaves yellow, but they turned green again when drained and cooked. Does this make sense or is my memory faulty? How long will the spinach keep once you move the jars to cool storage? I am interested in the negative effects on Hashimoto’s. I have it as well but need the digestive benefits of fermented vegetables. I have fresh spinach and wanted to try this Kraut. Anyone else get answers to this question? I have seen two opposite answers. Also, if you buy a culture pack to use when fermenting, in addition to the salt, am sure that would help in preventing botulism. So if the juice from the lemon and spinach does not cover the spinach completely is that a problem? Yes. Anything above might grow mold. Not a big deal. You just pick it out. You can always add a little salty water if it doesn’t stay under. Some people weigh the vegetables down with a ziplock bag full of water or stones (anything clean that keeps it under). I’m intrigued! Does fermenting high oxalate foods lower them to a medium or lower?